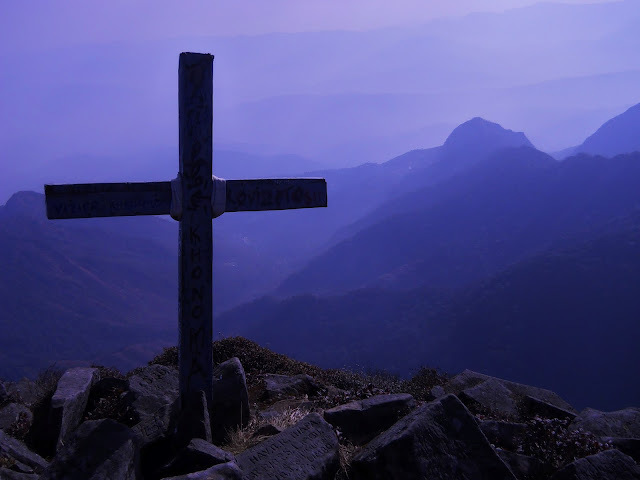 The cross over hazy Nagaland. On the peak of Mt. 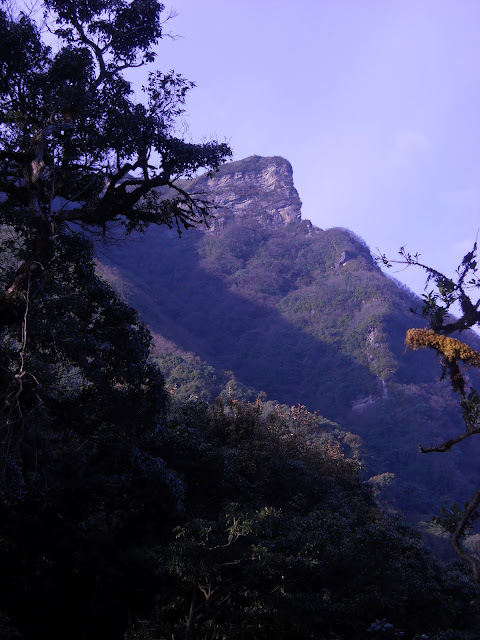 Japfu (10000 ft), the second highest in Nagaland, after Mt. Saramati in Tuensang district. Hi. So, this is going to be a series of three posts covering my whole trip to Nagaland. I'll be going over some of the same ground as before, though in much more detail this time around. 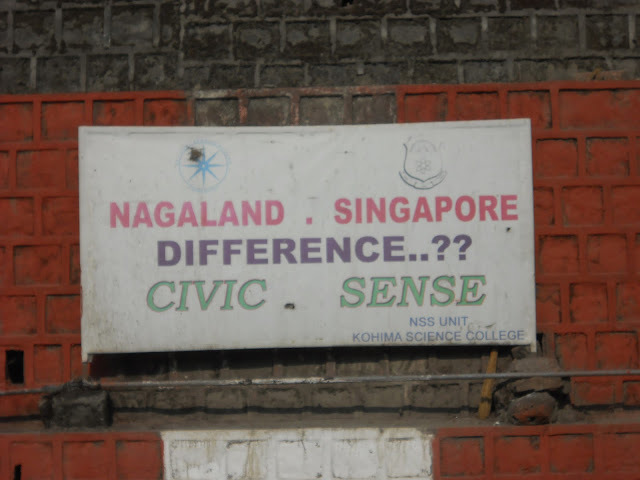 Anyway, Nagaland is a state about as far east in India as you can go. I first heard about the Nagas (after whom the state is named) way back in middle school. I remember reading a book called Stillwell and the American Experience in China. A passing reference is made to the Nagas when the author is discussing the flight of General Stilwell (who was serving as Chaing Kai Shek's cheif of staff at the time) over the Patkai range in 1942, as the Japanese were overrunning Burma. But I have long wondered what this region of the world was like, and it was back then that I first remember taking any particular interest in India. 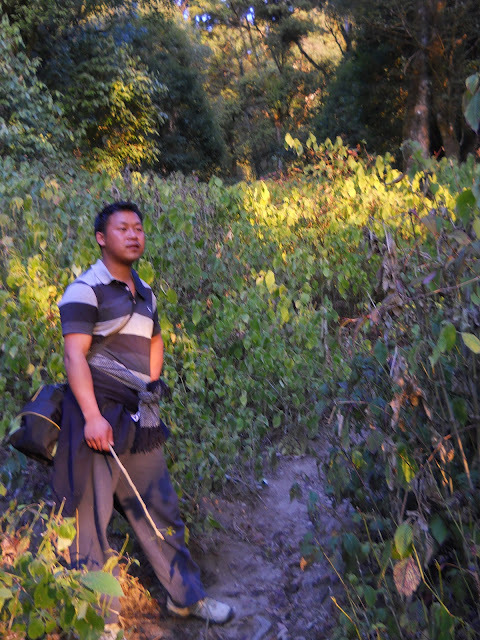 On this trip, I threw myself into Nagaland without much knowledge of the state, or, for that matter, any sort of a plan. 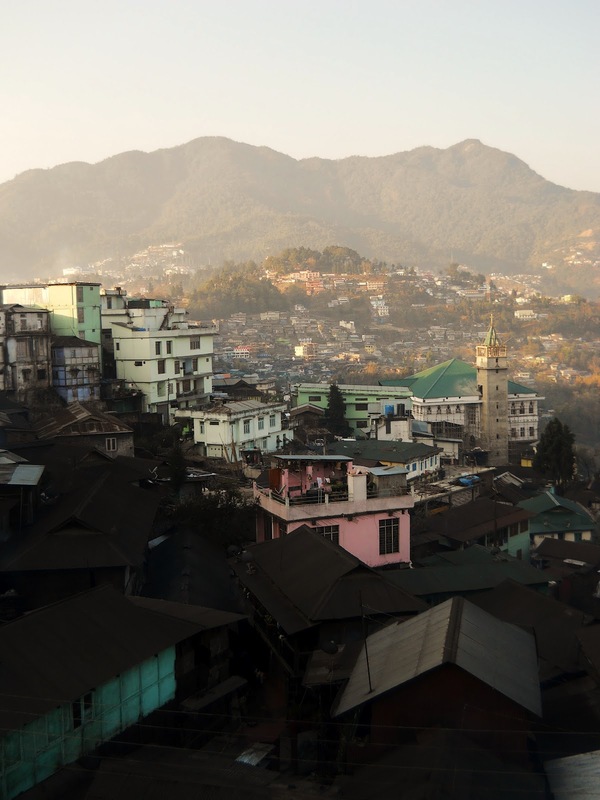 I had a vague conception that I would go to Kohima, and then make it up as I went along from there. 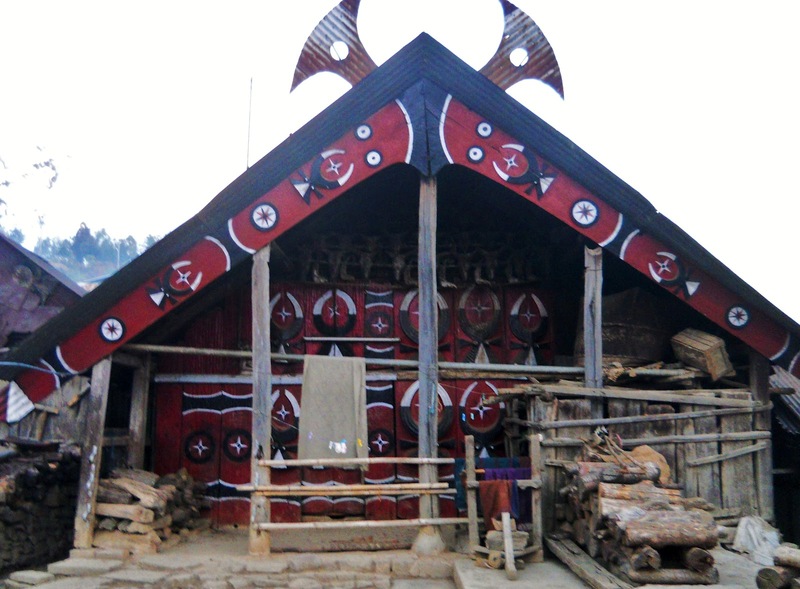 As it turns out, the tourist infrastructure in Nagaland is just beginning to develop, and what there is is mostly based around the Hornbill Festival (a government run display of Naga unity in diversity) which is held in December. When I went, in February of this year, I saw very few other tourists of any sort, Indian or otherwise. However, the place is not geared at all towards low-budget, individual tourists like myself. That meant that I spent much of my time not knowing what the next move was, or even what there was to do. But, that being said, Nagaland, like most of the Northeast of India, is the sort place where it's interesting just being on the street. When I came to Nagaland, I approached from the west, taking the Northeast Frontier Railway from Jorhat to Dimapur. I had spent the previous week in Assam, mostly on Majuli Island, which, despite having a majority population of Mongoloid (that's the technical term) Mising tribal people, still feels connected to the rest of India. But travelling from the plains up into the hills of Nagaland is like crossing into a different country. The people look different, have different languages, customs, food habits, and are not, nor have ever been, Hindus. In my personal travels over the past four years in India, I have never been to a place that seemed less “Indian.” Even a region such as Ladakh in far northern India, where a large portion of the population is of Central Asian stock and follows the Tibetian Buddhist faith, one still feels that the culture there is closer to that of Mainstream India than that of the Nagas. This is because of the huge historical contribution India has had on the cultures that are lumped together as “Tibetian.” Buddhism may have been introduced to Tibet from India possibly as early as the 7th century A.D., and though it has since then developed a life of its own in the Tibetan world, there can be no doubt that there is a deep connection between Tibetian cultures and those that are referred to as “Indian." But no such connection exists between the Nagas and the cultures of Mainstream India. The Nagas were never in any meaningful sense subjugated by Indian rulers, nor were they ever partially Aryanized, as, for example, the ethnically related Meithai people living to the south were. In their various languages, they have more in common with the Chinese than they do with their next door neighbors the Assamese. Nor do they have any caste distinctions or prohibitions regarding the consumption of beef. But what makes the state of Nagaland feel more dissimilar from the rest of India than perhaps anything else, is the extreme ubiquity of Christianity. I have never been to a place, with the possible exception of certain Tibetian Buddhist areas, where religion so thoroughly dominates the landscape. In large towns in Nagaland, almost anywhere you look, you will see a Christian church of one denomination or another. In talking about the Nagas, it's first important to explain what exactly is meant by the term “Naga." But that, I fear, is a less easy task than one might assume. In the very most general sense, you can say that the Nagas are a group of people who live in the hill country between the Bramaputra in India and the Chindwin in Burma, who used to practice headhunting, once followed a vague, animistic belief system, and who speak a variety of Sino-Tibetian languages. But beyond this simple definition, pinning down what exactly is meant by “Naga” becomes difficult. For one thing, the word was not originally self-applied, but was coined by outsiders. The etymology of the name is obscure: When it is theorized to be of Indo-European origin, it is sometime claimed to be derived from the word “nanga,” meaning naked, or from “Nag” meaning snake. But an alternate theory states that the word is of non-Indo European origin and comes from the Kachari word “Naga” meaning a young man. However, what is clear is that, up until relatively recently, the people who we now know as “Nagas” did not refer to themselves as such, and certainly the notion of a pan-Naga identity would certainly have been totally foreign to them. Furthermore, in the recent past the title was given to groups, such as the Abhors of Arunachal Pradesh and the Kukis of Mannipur and Mizoram, which today are usually no longer considered to be within the Naga fold. To make the matter of defining “Naga” even more confusing, there is the fact that the names of the various Naga “tribes,”of which, depending on who you talk too, there can be anything from fourteen to eighty of, have also been largely imposed from the outside, mostly by the British. The terms “Konyak,” “Anagami” or “Ao,” refer only to groups of Nagas who have relatively similar cultures and languages (though individual villages often have separate dialects). But, back before the practice was stamped out, the fact that two villages might be described as being inhabited by “Konyak Nagas” did not mean that they would abstain from collecting each other's heads. Also, many of the tribes are not the product of any organic historical process. An example of this is the Chakhesang tribe, which was formed from and alliance of Eastern Angamis and a part of a group called the Sangtangs in the middle of the twentieth century. In actuality, the way the Nagas were historically organized was into villages, that were basically their own, small, independent states (unless the village was a vassal of another, a situation which you might have encountered in the territory of the Konyak Nagas, where the practice of chieftainship was common.) However, two villages that might have both been culturally "Ao" might also have been mortal enemies. As I travelled through the State of Nagaland, which was formed only in 1963 and encompasses less than half of the people who call themselves Nagas, I was struck by the sharp differences in language, material culture, and physical appearance one encountered simply by going from town to town. Indeed, if Nagaland felt like a different country from the rest of India, then the city of Mon in Northern Nagaland, which is dominated by the Koyak Nagas, felt like a different country from the city of Mokocheung in the center of the state, where the Ao Nagas form a majority. It is often said that Northeast India is a region of “Cultural Superdiversity,” and my experience of Nagaland fully bears this out. This first entry will only cover the time I spent in the southern part of Nagaland, where the Angami's are the dominant tribe. There are a couple of places in the near vicinity which I would still really like to visit, namely the Dzuko Valley and Khonoma Village, but limited time and confusion got in the way. Kohima. Once an Angami Naga villiage, it became the capitol of the British Naga Hills district in the late 19th century. It was also the site of a fierce battle between the British and the Japanese in 1944, during the U-Go offensive, the Japanese invasion of India. The plan was to mount a spoiling attack that would prevent an impending allied invasion of Burma, along with capturing allied airbases in India. If you were to compare the Nagas with American Indians, the Angamis would be the Apaches. Culturally a powerful and proudly war-like people, an Angami village was once a danger to all of it's neighbors, while Angami warriors would roam far and wide on headhunting expeditions. They were the Nagas that the British has the most trouble with. It was Angamis from Khonoma Village who, in 1879, killed the first sub-inspector of the Naga hills and subsequently laid siege to the British in Kohima. The British broke the siege, and then, in one of the defining moments in Naga history, attaked Khonoma, ultimately defeating the Angamis and bringing about an end to all major Naga resistance to their rule. After Indian independence, the Anagami's continued to provide resistance against outside rulers, though now it was against the Indian government rather than the British. 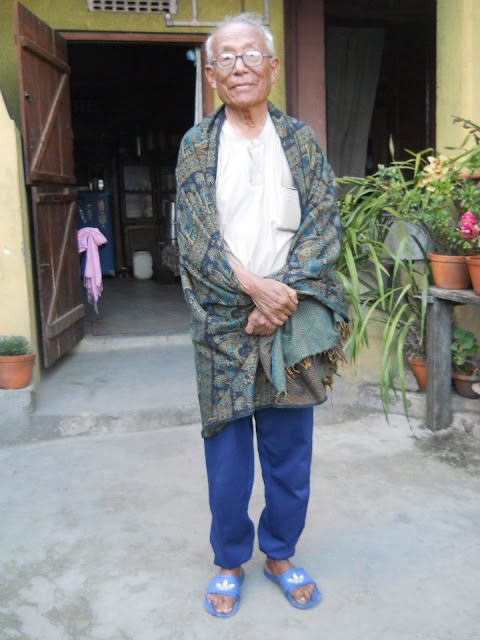 Zapu Phizo, the leading figure in the Naga independence movement, was an Angami, from, again, Khonoma Village. After the World War Two, he advocated the formation of an independent Naga state, called Nagalim, that would have to separate from India. This was the cause of one of the 20th (and now 21st) century's longest running conflicts, which continues, albeit at a much reduced intensity, to this day. One thing about the culture of the Angamis that struck the British as particularly noteworthy was that, unlike, for example, the Konyak Nagas to the North, the Angamis were apparently almost excessively democratic when it came to village governance, so much so in fact that western observers would often wonder how they managed to function at all. A random sign in Kohima. It speaks for itself. 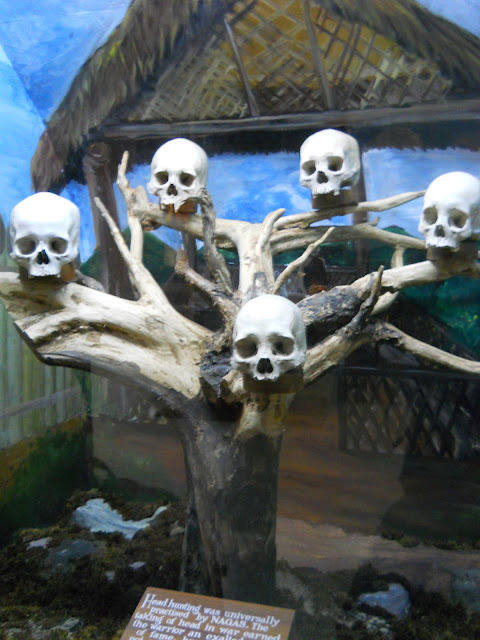 Human skulls at the Nagaland State Museum, taken during headhunting raids in the 19th century. I have heard and read a variety of explanations for why the practice of headhunting occurred. Some say that the Nagas used to believe that the head was the seat of spiritual power in a person, and that by cutting it off and bringing it back to your village, you sort of "collected" that person's supernatural energy. Another theory was that taking a head was the Naga way of demonstrating your own prestige. Also, apparently the warrior who took the most heads got the most girls. 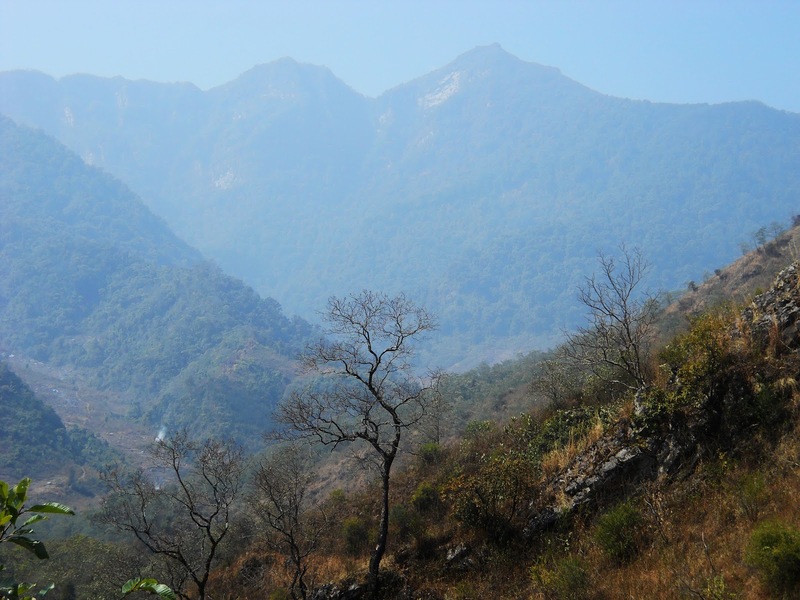 In this part of Nagaland, headhunting was largely stomped out in the 19th century. The British administrators outlawed headhunting, and wherever they decided to make their presence felt, the practice died out soon thereafter. I had thought these would be the only human skulls that I would see during, but I was mistaken. Incidentally, the Nagaland state museum is quite good, and well worth a visit. I wound up staying in the outskirts of a village called Kigwema, about 15km from Kohima, at a guesthouse called Greenwood Villa, run by a certain Nino.Nino is my friend Gitu Barua's cousin Loni's sister's friend (!!!!). 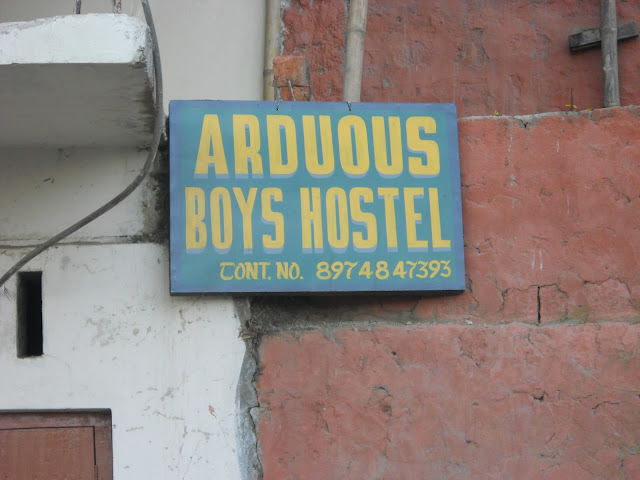 Also staying there was Nino's brother Avilei, who at the time was working as a construction contractor at a nearby army base, and an old Maharashtran couple, I think from Pune, who despite being technically from the same country seemed just as out of place as I did. View towards the Baptist church at the Southern Angami village of Kigwema. In just this one village, six different denominations of Christianity have a presence. The two main churches are the Baptists and the Revivalists. 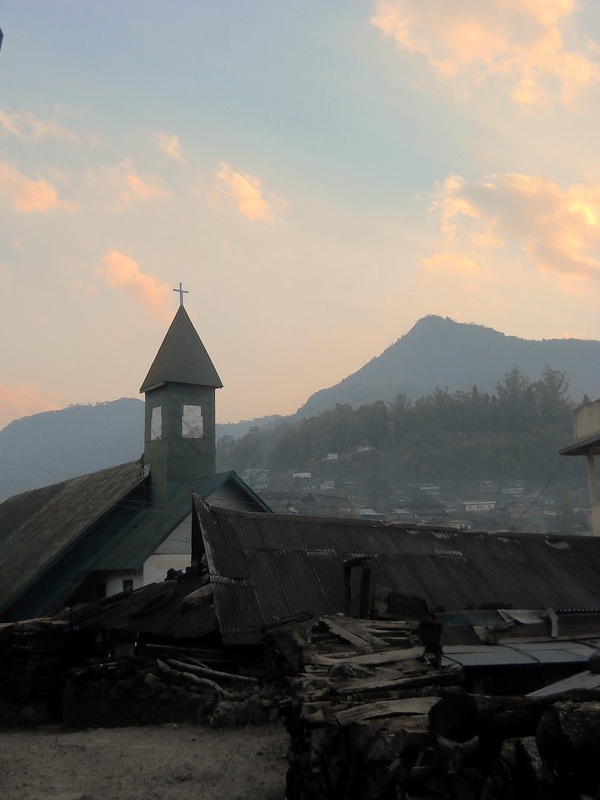 Nagaland, a place that was, only one hundred years ago, dominated by animistic headhunters, is today more Christian than any part of the U.S., with over 99% of the population having now converted. Starting in the 1840s, the groundwork for Naga conversion was laid by American Baptists, beginning with Miles Bronson (who had no success), and later E.W. Clark with the Aos, and C.D. King with the Angamis. However, progress was slow at first, with converts numbering only in the hundreds by the turn of the century. 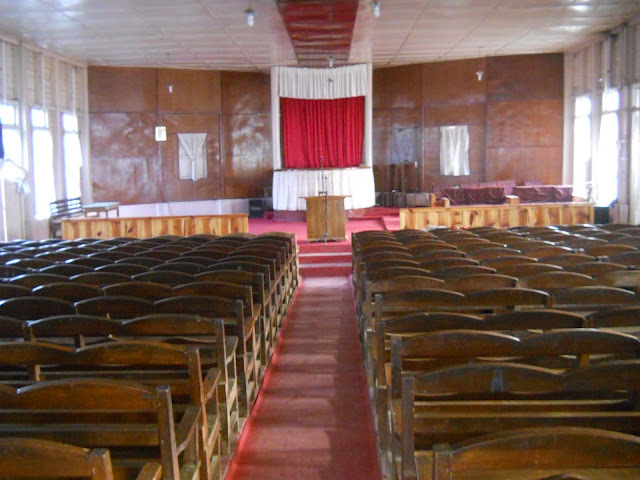 The vast Revivalist Church in Kigwema. Though conversion to Christianity had been building momentum throughout the first half of the twentieth century, it was only after the middle of the century that Christianity became truly dominant. 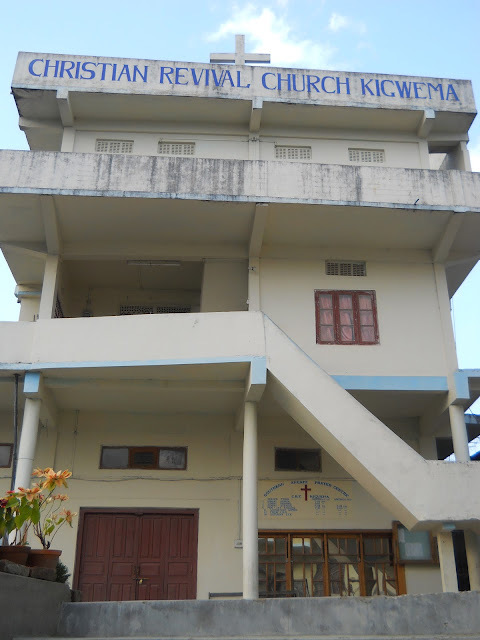 This giant building is the main Revivalist Church for the whole Southern division of the Angami Tribe. The revivalists base their faith around a passage from the Gospel of John: "When the Spirit of truth comes, he will guide you into all the truth, for he will not speak on his own authority, but whatever he hears he will speak, and he will declare to you the things that are to come." The interior of the church. Apparently they need to build a new one, as this one barely has enough space. Truly, Nagas are much more than nominally Christian..
Pastor Viketou, the head of the Revival Church in Kigwema. My excellent host, Nino, introduced me to him, and he gave me a lengthy description of his beliefs. 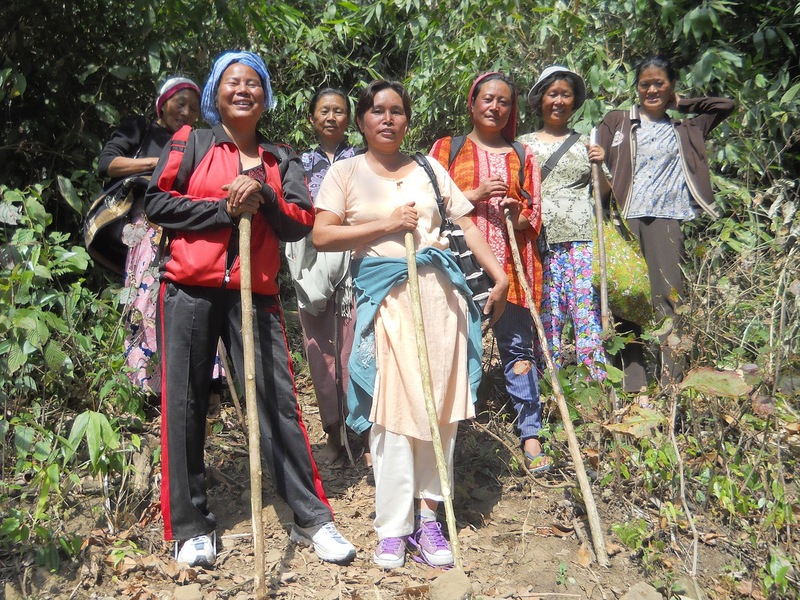 The Naga Revivalists developed out of the Baptist Church in the 1950s, when the Naga nationalists' war with the Indian government was at its most intense and traumatic. According to Viketou, the Revivalists believe that they have been made aware of the word of the lord, not though any action of their own, but through divine providence. They also believe that the end of the world is nearly at hand, and they emphasize intense prayer and fasting. They even have small, spartan rooms on the church grounds that one can rent out specifically for the purpose of praying and fasting for prolonged periods of time. Their break with the Baptists occurred in the 1950s, partially because of the apocalyptic aspect of the Revivalist doctrine and also because the Baptists weren't ready to accept certain miracles that the Revivalists had claimed to have taken place. Viketou is well into his nineties, and was in his twenties during the Japanese invasion, which he remembers quite vividly. Apparently a bunch of Japanese troops stayed in the village. Also, he lived though all of the unrest caused by the independence movement, starting in the 1950s. The other side of village. 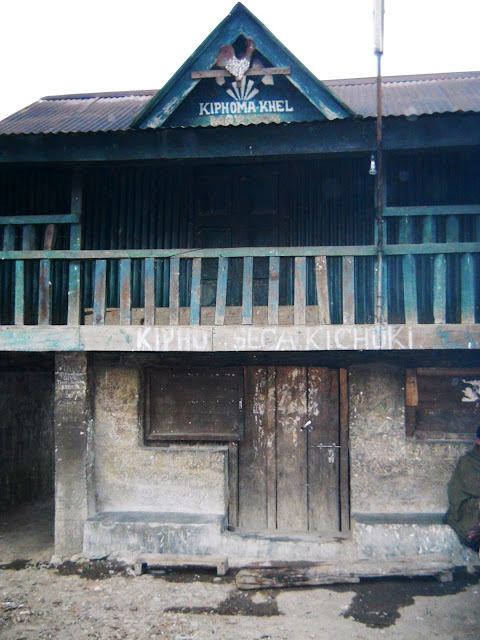 A semi-traditional Angami Naga house. Obviously, corrugated metal is a recent development, but otherwise, this what the house of a well-to-do Angami Naga would have looked like before the coming of modernity. The horns on the top of the house announce that the owner occupies a high position in the local community. 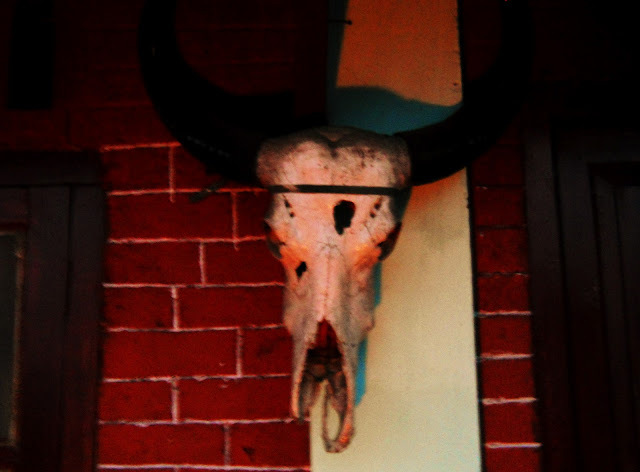 Notice also that the house is covered in both stylized and real Mithun skulls. Mithun are a variety of cattle that are common throughout the Northeast and in adjacent areas of Burma and Southern China. Among the Nagas they are a symbol of wealth, and also a source of food. Kigwema has quite a few houses that are built along traditional lines. The Morung for one of the Khels (clans) of Kigwema village. Morungs (or, boys dormitories) were a standard feature in Naga society. They were where all the unmarried boys in a village would sleep, and also learn all of the various skills and traditions of their clan. Also, the Morung served as a sort of barracks: before modern times, headhunting raiders from other villages were a constant threat. Most Naga villages were built defensively on the tops of hills, and the Morungs provided a ready source of man-power in case of an attack. Real Mithun skulls. This would would be strictly taboo in Hinduism, but the Nagas were, and still are, far from Hindus. During the independence struggle, one major piece of propaganda employed by the separatists was that the Indian Government would impose a ban on the consumption of beef in Naga territory. 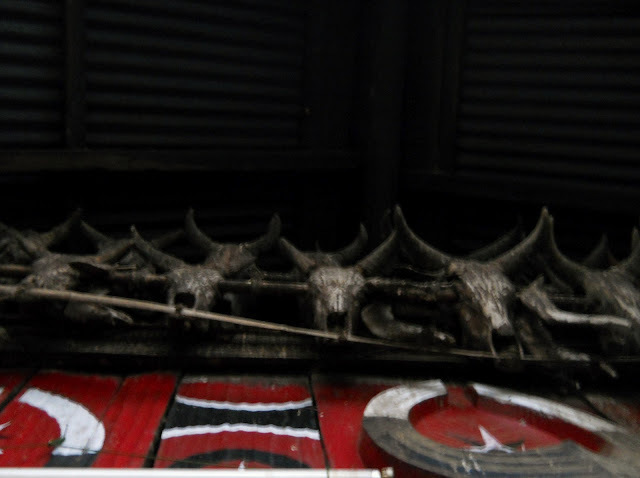 Kigwema dog.Yes, Nagas eat dogs. But they're a delicacy that is only served on special occasions. The meat is supposed to be quite nice. 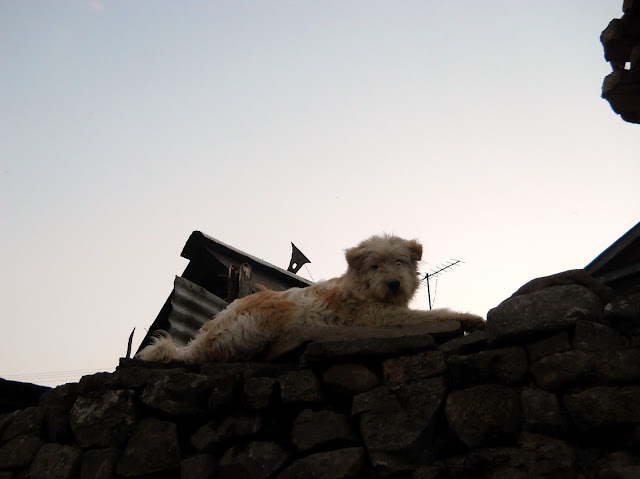 And there not being any street dogs in Nagaland is a myth, though it's true that one doesn't see as many as elsewhere in India. But this dog here, I assure you, is in no danger of being eaten any time soon. However, I did see a number of huge, meaty looking dogs being butchered in Kohima. A hazy view on Mt. Japfu. It's the tallest peak, just right of center. 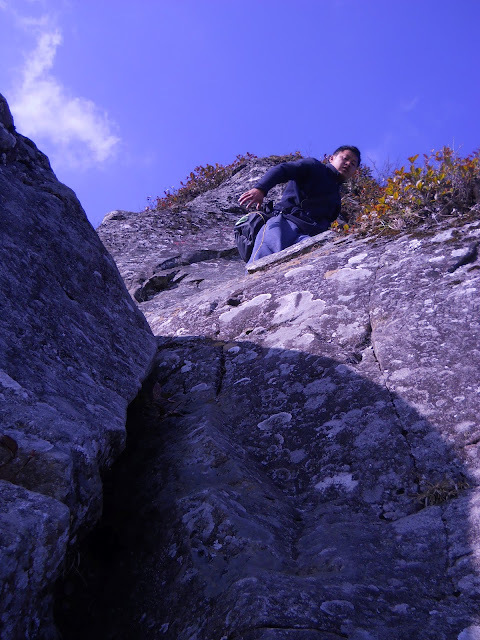 This is from a small (by Himilayan foothill standards) ridge that I climbed, just behind Nino's guesthouse. 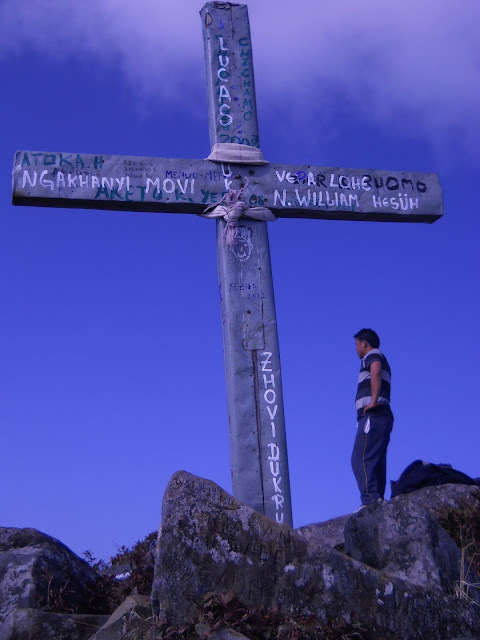 Climbing to the top of this was my main reason for being in Kigwema. 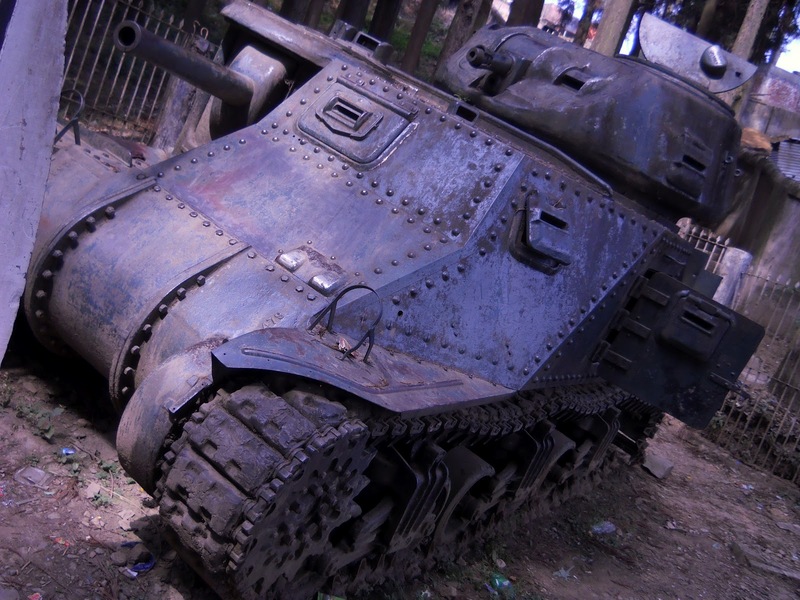 An American M3 Grant tank, disable during the battle Of Kohima, and left where it was as a war memorial. I hadn't been expecting to see this. 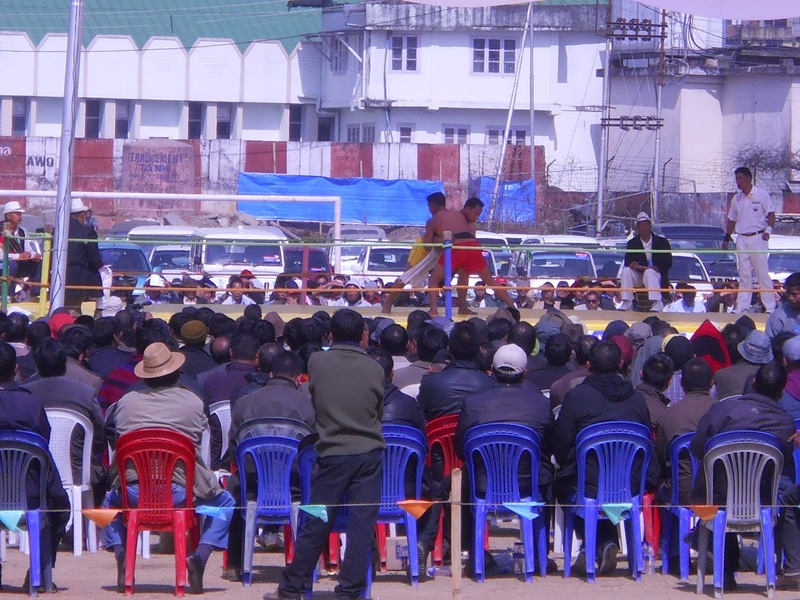 One day, sort of out of the blue, Avilei asked me if I wanted to go attend an Angami Naga wrestling competition being held in Kohima. "Sure," I said. Then, after picking up a few of his friends, he said something to the effect of "Want to see a tank?" "Sure," I said. Then he led to me this little park, which has been set up around where the tank was disabled. A different view of the vehicle. 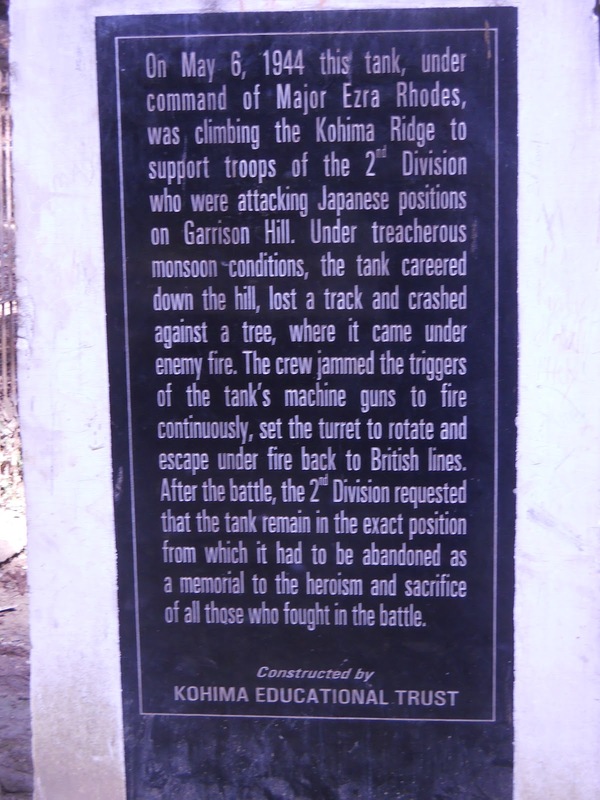 It was disabled during the climactic phase of the battle, as the British were fighting to retake Kohima ridge. The vehicle looks like it's in fairly good shape from the outside, but the interior is almost completely rotted out. Both the main guns seem to have been jammed into recoil position by the crew. The M3 Lee/Grant (the american version was the Lee, the British version was the Grant...I guess the Brits didn't want their weapon system to be associated with the Confederacy), was an American early war stop-gap measure to mount a weapon heavy enough in a medium tank to take on German designs like the Panzer III and IV. It was widely used by the Americans, and, through lend lease, by the British and the U.S.S.R. 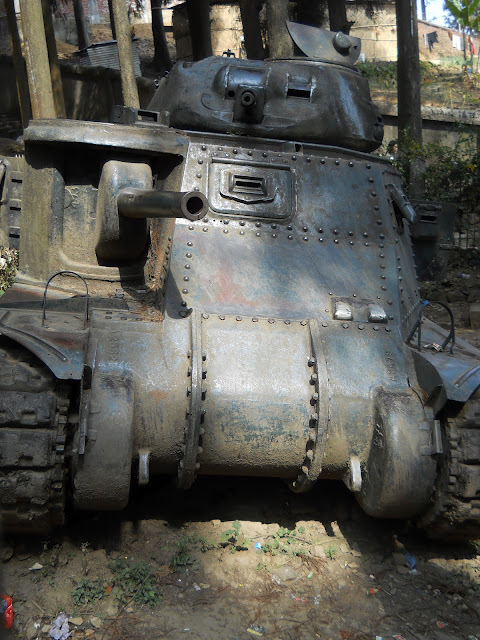 Most of the the allied tanks in the China-Burma-India campaign were M3s. It led to the development of the much superior M4 Sherman. As an aside, in front of the VFW in Newark, D.E., you can see the second M3 ever built. I used to go climb around on it when I was in 7th and 8th grade, so I've always had something of a soft spot for M3s (even if they weren't really all that great as tanks). Unexpectedly seeing one in the middle of Nagaland was, oddly enough, like blundering into a little piece of home. The story of what happened to the tank. Anagami wrestling, which is rather like Sumo Wrestling, though with smaller wrestlers. This was a wrestling competition for the whole Angami tribe. It went on for the whole day, and this was only the first day of two. Those white cars you can see in the background are part of the Cheif Minister of Nagaland's security contingent. He left midway through the match, his car accompanied by twenty or thirty others as they drove off the grounds in a big cloud of dust. It looked exactly like something you would see in a Bollywood movie and think was improbable. 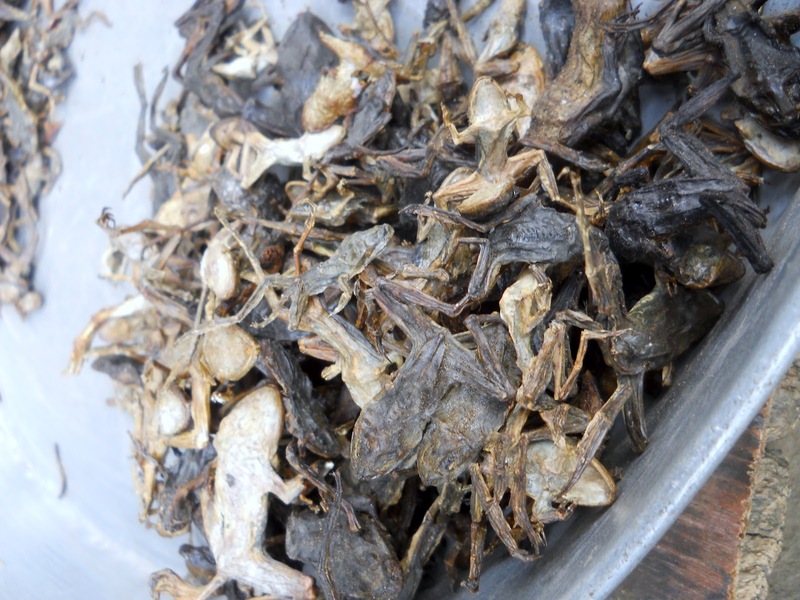 Dried frog snacks at the Kohima outdoor market. It is true that Nagas will eat every sort of exotic meat, though the mainstays of their diet is rice, with plenty of pork and beef. I'm not sure if I would eat these dried frogs here, but most of the Naga food I had was really very good. At the wrestling match they were selling all sorts of interesting food to the people in the stands, including big hunks of Mithun meat, spiced pork, and Naga snails (which anyone who has a taste for shell fish would like). Avilei and his friends demanded that I take a couple of bites out of a big, inch-thick hunk of Mithun skin they had. It actually tasted pretty good, though the consistency was rather too rubbery for my liking. Avilei and his friends also purchased a bunch of rice beer, which made the six hours of the wrestling match go by much quicker. My book bag still has big stain where I spilled some. When I took the above picture, me and Avilei had taken a break from the match so that I could buy a new flashlight for myself and some chocolate as a present for the girls who worked at the guesthouse. I remember going down into an underground shopping complex full of stores which sold nothing but weird Chinese made black-market electronics. They had an amazing selection of blindingly bright flashlights and lamps, along with every other Chinese bootleg item you could think of. Yes, the black market is popping in Nagaland. I would have liked to bring a bunch of stuff back home, but unfortunately I didn't have enough space in my one backpack. Avilei at sunup, on the way to Japfu peak. After the confusion with my guide from Kigwema, Avilei extremely nicely volunteered to guide me up to the top. Our aim had been to try and get to the summit for sunrise, when the weather is clearest. We were supposed to leave by 3:30 A.M., but didn't wind up leaving until 4, I think mostly because the two of us had spent the whole day before eating huge quantities of pork, beef, and snails, and drinking lots of Naga beef. And then, as we were stumbling through the pre-dawn darkness, we took a wrong turn and lost about another 45 minutes, so by sunrise we still had a long way up the mountain to go. 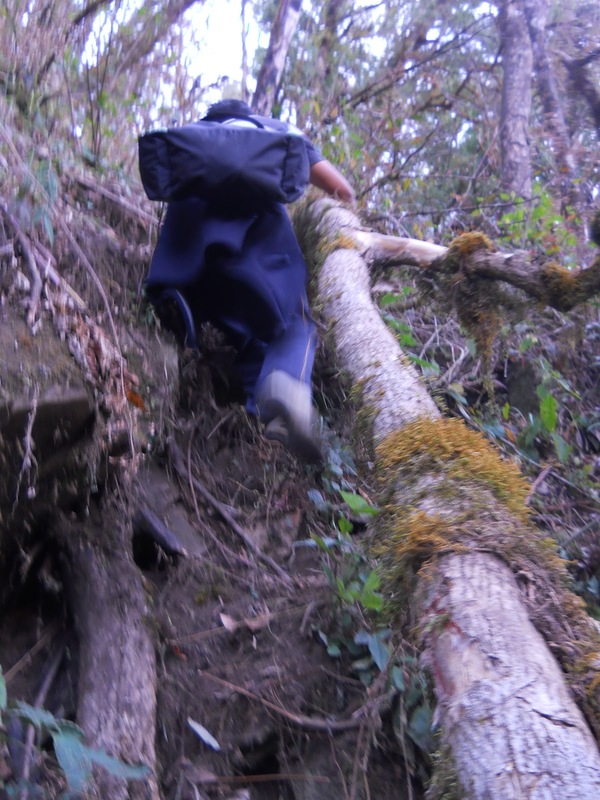 Lost in the jungle, climbing a near vertical slope. We lost out way once again, at about 8500 ft, after entering the jungle. At one point the path bifurcated, so we, logically, took the way that seemed to be going up the slope, rather than off to the left. 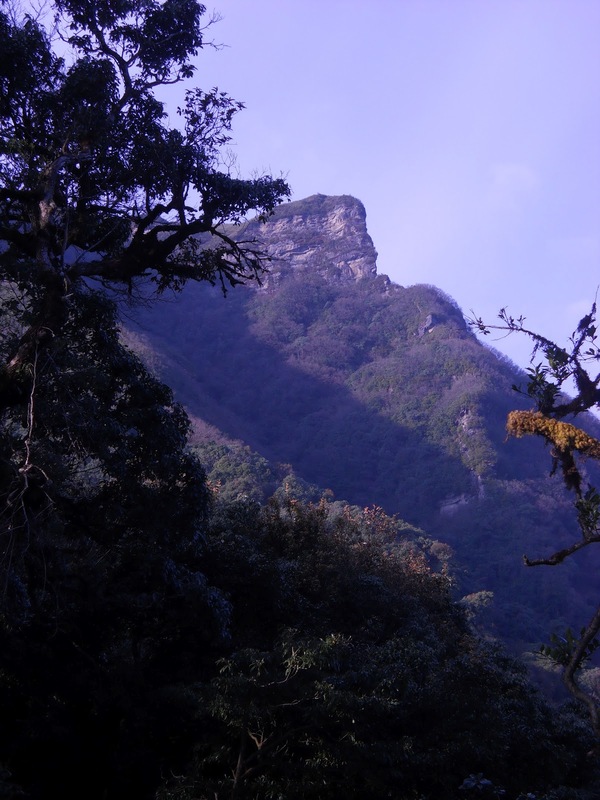 But the path we followed soon degenerated into little more than a faint track, while the slope kept getting steeper and steeper, until we noticed that we were no longer walking, but climbing, up the side of the mountain. Luckily we found our way back to the path further up. View on the peak of Mt. Japfu, from a ridge line that the path runs along for a short time. The track that we got lost on intersected this ridge-line, so all we had to do was follow the ridge in order to reacquire the path. 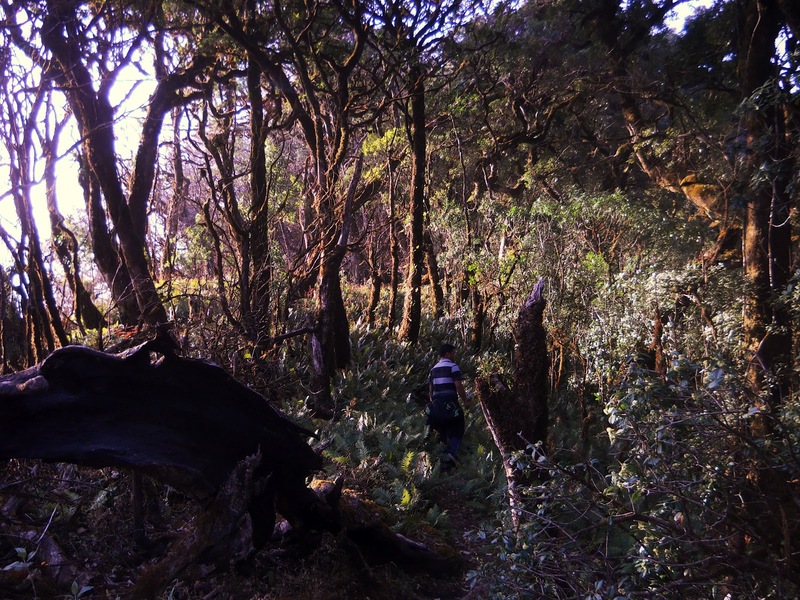 Trekking through Rhododendron forest. By this point I feel like I've spent half my life among Rhododendrons. I've heard that the world's tallest Rhododendron Tree is on the side of Mt. Japfu. It's nearly impossible to pick it out in winter, but during Spring, when the flowers are in bloom, you can tell which tree it is because it's the first to flower. Avilei climbing rocks. Near the peak, the official trail begins to lead straight up rock faces that you had to climb up. Needless to say, there were no safety ropes. Actually, going down the rock faces was much more nerve wracking than going up. The view west from the peak. On a clear day, it's said that one can see all the way from Mt. 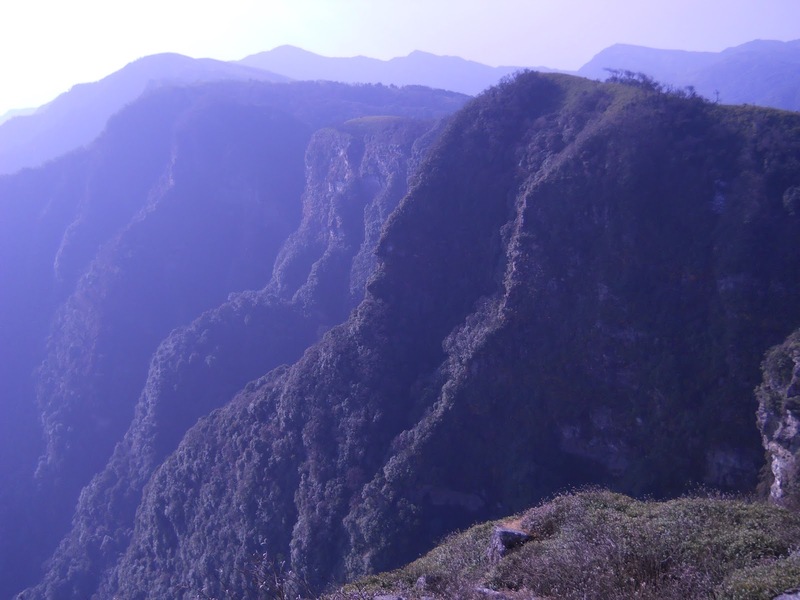 Kanchjunga in Sikkim to the west, to ridges deep in Burma to the East. We met these women coming down. As me and Avilei were coming down through the jungle, having been hiking for somewhere in the vicinity of six and a half hours, we began to hear a sort of impassioned murmuring. Rounding a bend, we saw these women gathered around an intersection, deeply engaged in prayer. They were on their way to the peak, apparently as a sort of religious pilgrimage, but having come to the intersection, did not know which way to go. They therefore decided to pray to ask the lord to show them the way. And then me and Avilei suddenly stumbled out of the jungle. Given that very few western tourists pass through these parts, they were quite surprised to see me, and apparently took my miraculous appearance in the middle of the jungle, showing them which way to go, as a sign from God. Avilei told me that a few of them were around 80 years old, and for someone 80 years old to have come even this far was quite an achievement. Still, I'm doubtful any of them were able to make it up over the obstacles at the end of the trail near the peak. But we can hope. The next day, I decided to shove off for Mokokcheung, which is the main city in the region of Nagaland dominated by the Ao tribe. I had hoped to see Khonoma village, but, as it turned out, I would have had to have waited two days before transport would be available. Since I had no further business in Kigwema, I opted to move on to Mokocheung, and whole new cast of characters.